AIS Premium series Industrial AI and GPU-powered embedded computers are designed to handle the most demanding deep learning, computer vision, image recognition, data mining, and robotics control tasks, supporting Intel® Xeon®/Core™ i7/i5/i3 processor, NVIDIA® GeForce® GTX 1080/1070 GPUs, display interfaces to support for 8K resolution, dual-channel ECC up to DDR4 2666MHz 64GB memory, dual Gigabit Ethernet, multiple PCI/PCIe expansion, multiple I/O connections, 3 SIM sockets, USB 3.1, 32 isolated DIO, 12V to 36V DC power input with 80V surge protection, ignition power control, smart manageability, compliance with CE, FCC, EN50155, EN50121-3-2, IEC 60068-2-27, and IEC 60068-2-64, and is built to withstand some of the toughest environments with its -20°C to 60°C (-4°F to 140°F) operating temperature range. 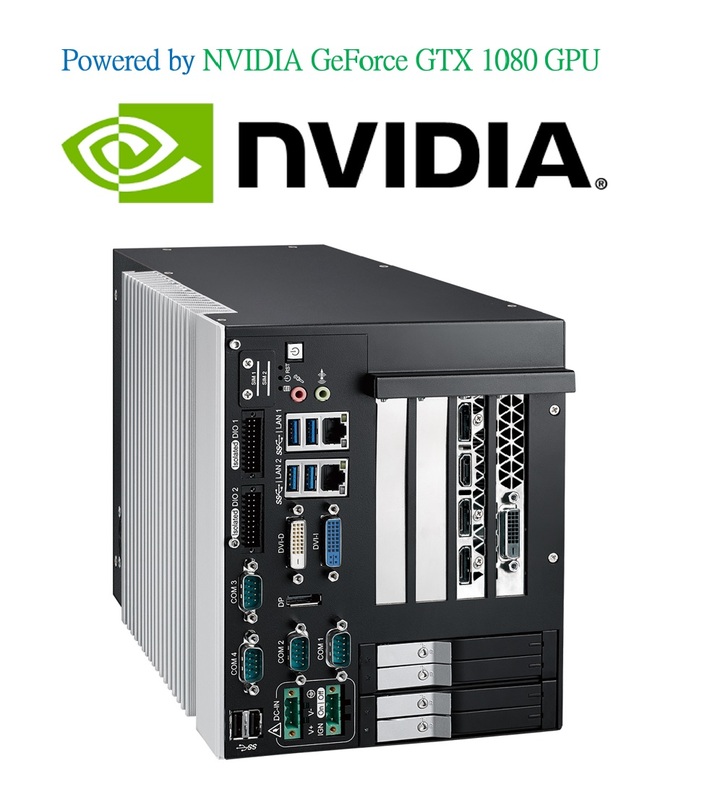 AIS GPU-powered AI computers are engineered to meet the increasing computing demands of the next generation of control, visualization, and machine intelligence applications with integrated high-performance NVIDIA® GPUs, CUDA® APIs, and Intel® Xeon®/Core™ i7/i5/i3 processors, are built to meet the demands of harsh industrial environments. Leveraging flexible, standardized communication interfaces and extensive software API support allows for easy and efficient context-aware computing integration into almost any robot, machine, cloud-based, and big data applications, or industry such as healthcare and life sciences, automotive, agriculture, manufacturing, energy and utilities, transportation, and autonomous factories. AIS Premium Industrial AI Computers are powered by NVIDIA® GeForce® GTX 1080 GPUs and Intel® Xeon® processors, 2 GigE LAN, 1 PCIe x4, 1 PCI, 4 Front-access SSD Tray, 4 COM, 7 USB 3.0, 3 SIM, Isolated DIO. AIS Premium Industrial AI Computers are powered by NVIDIA® GeForce® GTX 1070 GPUs and Intel® Xeon® processors, 6 GigE LAN (4 PoE+), 4 SSD Tray, 6 USB 3.1, 4 COM, 3 SIM, 32 Isolated DIO. AIS Premium Industrial AI Computers are powered by NVIDIA® GeForce® GTX 1070 MXM GPUs and Intel® Core™ i3 processors, 2 GigE LAN, 1 PCIe x4, 6 USB 3.0, 3 COM, 3 SIM, 32 Isolated DIO.